In the preceding chapters we have dealt with the various principles of pay determination as was enunciated by the successive Pay Commissions. The 6th CPC introduced the new concept of Pay Band and Grade Pay. We are not able to comprehend any logical methodology having been adopted by the 6th CPC in constructing the Pay Band and Grade Pay. In the ultimate analysis, we found that there had been no uniform multiplication factor. It varied from 2.2 time to 3. The changes effected by the Government while implementing the recommendations of the 6th CPC further compounded the confusion and making it more irrational and arbitrary. The 6th CPC in their report stated that they have upgraded certain pay scales having appreciated the contention made by the employees organizations. They merged certain other pay scales in an effort to delayering the functions. But the new pay that emerged from such upgradation/merger was not equivalent to the higher pay scales in the said group. For instance, the erstwhile pay scales of Rs.5000-8000, 5500-9000 and 6500-10500 were merged. The multiplication factor for pay band construction was 1.86 times of the minimum. Therefore the pay band for the pre merged pay scales was determined to begin at Rs.9300/-. Having merged, the pay band must have begun at 12,090/-, i.e. 1.86 times of 6500/- in which the other pay scales were merged. 7.2 The manner in which the Grade pay was devised is also questionable. At the lower level the Grade Pay progresses @ Rs.100/- ,i.e. 1800, 1900, 2000, etc. The pay in the Band + Grade Pay at the entry level is 5200 + 1800 = 7000. An employee is entitled for 3% increment every year. He gets a financial benefit of Rs. 210 every year on account an increment whereas on promotion his grade pay gets increased by just Rs.100/- only. The Grade Pay was devised at 40% of the maximum of the pre revised time scale of pay. 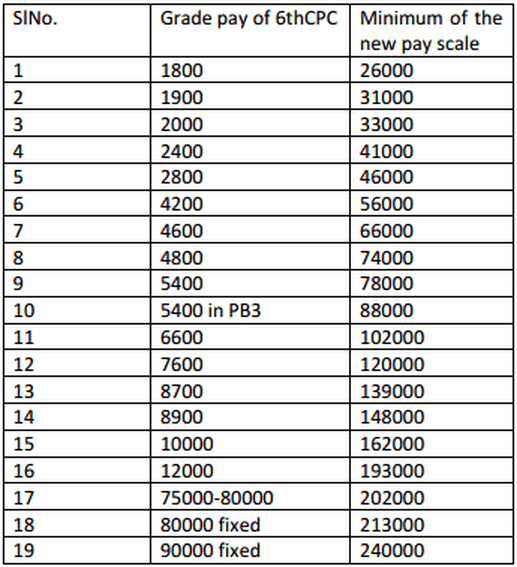 The maximum of any time scale of pay will depend upon the rate of increment and the span of the scale of pay. The ratio between the minimum and the maximum of all pay scales was not uniform, rather it could not be uniform. Therefore, prescribing Grade Pay as a percentage of such variable maximum, in our opinion, was erroneous. Normally fitment benefit represent the gap between pre revised minimum and the revised minimum. The 6th CPC recommendation of Grade Pay did not serve this purpose also. Having been expressed in absolute quantum amount it gave varied benefit in different pay bands as also at different stages in the same pay bands. 7.3 The Grade Pay system brought about various anomalies, which were raised at the NAC but found no resolution despite discussions on several occasions in the last 6 years. We are of the firm view that the 7th CPC should revert to the Pay Scale System which has been time tested. We have constructed the pay scales maintaining the relativities with the time scale of pay suggested by both 5th and 6th CPC. 7.4 While constructing the pay scales we have taken the rate of increments at 5% instead of 3% presently available. We have done so on the ground that most of the PSUs including the banking industries provide the incremental rate at 5% and over a period of time it raises the salary level of the personnel. We therefore request that the 7th CPC may recommend the rate of annual increment at 5%. Incidentally we may also state that the uniform date of increment prescribed by the 6th CPC has encountered certain problems and anomalies. We, therefore, suggest that the 7th CPC may recommend, for administrative expediency, two specific dates as increment dates, Viz. 1st January and 1st July. Those recruited/appointed/promoted during the period between 1st January and 30th June will have their increment date on 1st January and those recruited/appointed/promoted between 1st July and 31st December will have it on 1st July next year. This apart we request the Commission to specifically recommend that those who retire on 30th June or 31st December are granted one increment on the last day of their service. 7.5 We have also felt that a further reduction in the number of pay scales is needed. While constructing the pay scales we have removed those pay scales pertaining to Grade Pay of Rs.1900, 2400, 4600, 8700 and the scale of pay of Rs. 75500-80000. We are of the opinion that the instrument of Special Pay which was in operation earlier should be brought back to address the need of intermediary grades in certain organizations. The Associations and Federations representing the employees and officers of various departments and various categories will submit their memorandum indicating the pay scales to be assigned to the categories of the employees and officers they represent taking into account the nature of functions assigned to those categories separately. 7.6 Presently, functional promotion is made to the next hierarchical position whereas MACP promotion is Grade Pay based, irrespective of the fact whether a particular Grade Pay exist in the hierarchy or not in the concerned department. Our suggestion to reduce the number of pay scales go a great extent to obviate the difficulty encountered due to the dual system of promotion. 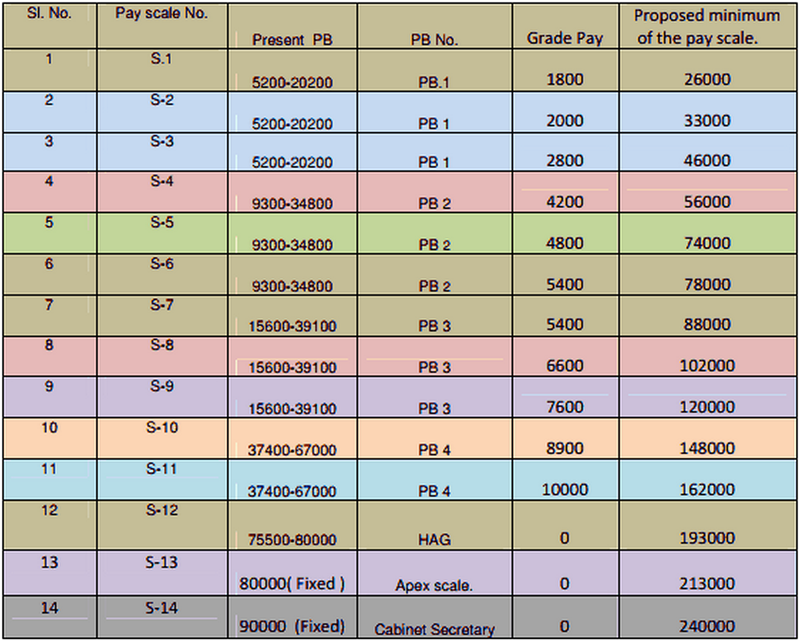 In Table 7.2, the corresponding pay scales of the 6th CPC recommended Grade Pay are given for reference.